"The Collaboration market is estimated to have a value of $35 billion US dollars and is growing at 26% annually as enterprises adopt cloud technology at a rapid pace. Due to the accessibility of cloud-based collaboration services, more organizations than ever before have access to visual communication tools," said Odd Sverre Østlie, CEO of Pexip. "We know that many organizations prefer a dedicated deployment with tight integration into their IT network, and over time want to combine this with cloud scalability. Others prefer a flexible public cloud service. 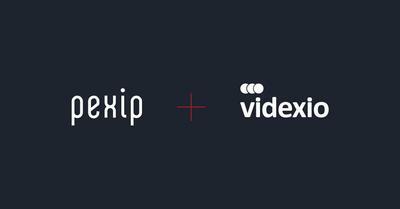 A merger between Videxio and Pexip will put us in a unique position to offer a product portfolio that will meet the needs of a broader range of users while we continue to introduce innovative solutions to the market. The joint sales and channel organization will ensure wider coverage, while the more diversified customer base will create an even more sustainable and robust business offering." "As one of the Co-Founders of Videxio, I am extremely excited at the prospect of this merger," said Tom-Erik Lia, CEO of Videxio. "The two companies are a great fit from a technology standpoint, as well as a people and culture perspective. We will continue to offer and develop the existing product portfolio, while building on the best elements from both companies. We have an outstanding team and for them the merger will create an exciting environment filled with new challenges and opportunities to grow, develop and innovate. Our channel partners will gain access to a broader portfolio of products and services to best address their customers' collaboration requirements while our customers will enjoy a wider range of solutions and continued innovation." Upon finalization of the merger, the combined company will be called Pexip and will continue to serve more than 300 partners globally, and users in more than 195 countries. It will be led by a strong leadership and founder team from both companies, with Odd Sverre Østlie as the CEO. Tom-Erik Lia will take on the role as Chief Commercial Officer. The transaction is expected to be completed by the end of 2018, following regulatory clearances and shareholder approval. \"The Collaboration market is estimated to have a value of \$35 billion US dollars and is growing at 26% annually as enterprises adopt cloud technology at a rapid pace. Due to the accessibility of cloud-based collaboration services, more organizations than ever before have access to visual communication tools,\" said Odd Sverre Østlie, CEO of Pexip. \"We know that many organizations prefer a dedicated deployment with tight integration into their IT network, and over time want to combine this with cloud scalability. Others prefer a flexible public cloud service. A merger between Videxio and Pexip will put us in a unique position to offer a product portfolio that will meet the needs of a broader range of users while we continue to introduce innovative solutions to the market. The joint sales and channel organization will ensure wider coverage, while the more diversified customer base will create an even more sustainable and robust business offering.\"
\"As one of the Co-Founders of Videxio, I am extremely excited at the prospect of this merger,\" said Tom-Erik Lia, CEO of Videxio. \"The two companies are a great fit from a technology standpoint, as well as a people and culture perspective. We will continue to offer and develop the existing product portfolio, while building on the best elements from both companies. We have an outstanding team and for them the merger will create an exciting environment filled with new challenges and opportunities to grow, develop and innovate. Our channel partners will gain access to a broader portfolio of products and services to best address their customers' collaboration requirements while our customers will enjoy a wider range of solutions and continued innovation.\"